Welcome to Down On The Street, where we admire old vehicles found parked on the streets of the Island That Rust Forgot: Alameda, California. 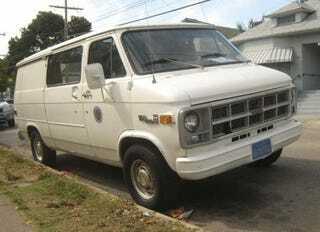 GM's Malaise Era big van didn't change much for decades, so it's easy to overlook. This 3/4-ton hauler belongs to the Alameda Unified School District, and probably delivered the crates of pencils, gallon jugs of Elmer's Glue, and that terrible pulpy gray paper that I used in elementary school. Nobody notices a plain white cargo van; I've probably seen it hundreds of times and only now have I paid enough attention to photograph it. It suffers from the usual Northern California top-down rust, which should eat through the metal in another decade or two.